BlacKkKlansman has the kind of plot point that is almost too good to be true: A black man manages to infiltrate the KKK. It is even better when you realise that this is based on a true story and although it is set in the 1970s, has a lot to say about the world today than it really should. Spike Lee has always been an expert at mixing entertainment and a political message. Aside from a very clear point in the movie, BlacKkKlansman never feels like it is preaching too much. Instead Lee manages to create a movie which is part comedy, part drama and even part action. It is intriguing and compelling from beginning to end and you can’t help but get drawn in by the bizarre events the movie’s story takes. That story is a great one. A bold move by the first black detective in Colorado Springs, Ron Stallworth calls the KKK and asks to become a member. Managing to convince the deeply racist representative that he shares the sames views, Stallworth then orchestrates an undercover operation where he takes care of the calls while a white detective plays him in person. It is a great set-up which has a clear foundation in the truth. It also lends itself so well to some great, tension filled scenarios. Two people playing one will always lead to confusion and there are plenty of times when the cover feels like it could be blown and Stallworth’s white counterpart finds himself staring death in the face. This is often offset well with the hilarious juxtaposition of a black man saying deeply racist things to a clearly convinced white supremacist on the end of the phone. The comedy is pitched perfectly without ever feeling too silly. It never plays for the laugh or makes light of the very dangerous game that Stallworth was playing but the situation lends itself to some great, awkward and beyond belief moments that can’t help but raise a smile. This is also down to how well the part is played by John David Washington. His interactions with an equally as funny Topher Grace, as the Grand Wizard of the KkK David Duke, make for some of the best moments of the movie and has some great pay-offs in the final third. The real star is Adam Driver though. He plays the white face of the operation. He is the man confronting the KKK head-on and finds himself in some of the tensest and more dramatic scenes. As well as a comment on race, there are also focuses on religion and antisemitism which effects Driver’s character. It is written well and isn’t a straight-forward detective taking on the bad guys but something slightly more complex, as Driver begins to wrestle with what his religion means to him now he is facing direct prejudice. There is a clear, serious message that pervades the whole film. Lee is outspoken in his beliefs about American society, especially with Trump as President and although it never feels like he is hammering home the political point continuously, there are moments where his message is clear. Unsubtle mentions of a future where the country is run by a bigoted President hold very little scope for interpretation. The ending is the most hard-hitting though when Lee replaces the stylised fiction with images and footage of the hard-ships African-Americans have faced in recent history, making his message for the movie very clear. 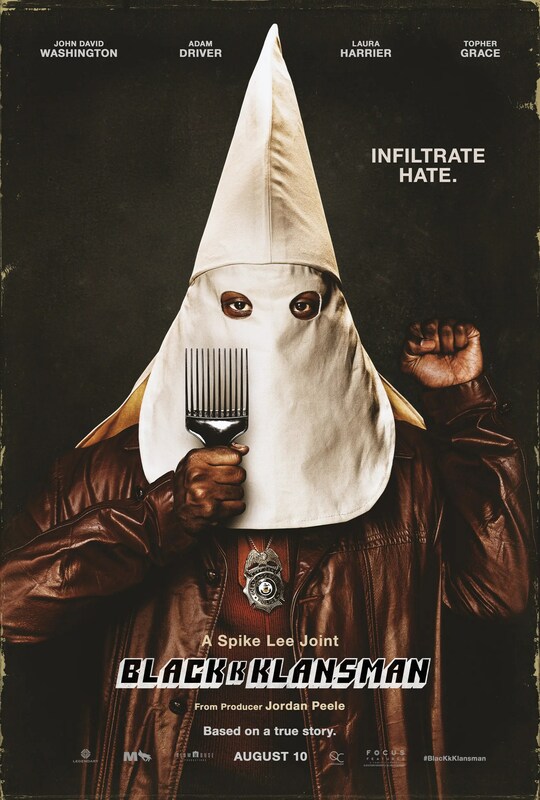 Overall, BlacKkKlansman is a clear politically motivated movie but one which is very entertaining. It is tense, funny and beyond belief considering the true story it is based upon. The performances are great but Driver manages to steal the movie once again. Just be prepared to face some fairly heavy truths about racism and American society.